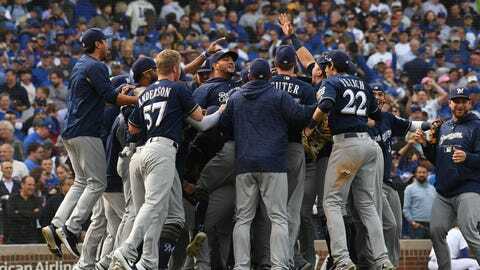 Coming off a division title and appearance in the NLCS, the Milwaukee Brewers don't have a lot of holes to fill. But might an addition here or there help propel the Brewers to the World Series? With the offseason and free agency upon us, FOX Sports Wisconsin runs down some (and certainly not all) possibilities for the Twins. With presumably some of Milwaukee's young pitchers headed to the rotation (i.e. Corbin Burnes, Brandon Woodruff), manager Craig Counsell could use a little help in the bullpen. 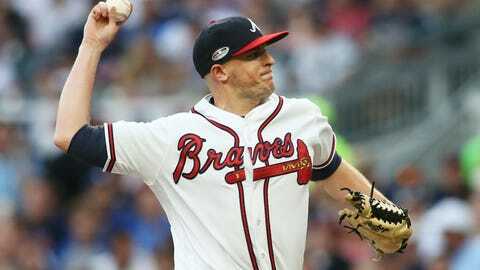 Brach qualifies in Counsell's role of an "out-getter" and has numerous experience pitching from the fifth inning on and has even closed out some games (33 career saves). Brach was excellent with Baltimore from 2014-17, posting a 2.74 ERA, 1.113 WHIP and 9.5 K/9 over 246 games. However, he slumped with the Orioles in 2018 (4.85 EA, 1.769 WHP) and was dealt to Atlanta, where he finished on a better note (1.52 ERA, 1.310 WHIP). The right-hander could be another strong arm in an already solid Brewers pen. The right-hander, who turns 29 in April, has always dripped of potential but he finally put it together in 2018 after missing the previous season recovering from Tommy John surgery. Eovaldi made 10 starts for Tampa Bay this season -- elbow issues curtailing his season a bit -- and had a stellar 0.982 WHIP along with 8.4 K/9. Traded to Boston, Eovaldi had a 3.33 ERA and 1.278 ERA in 12 games (11 starts). 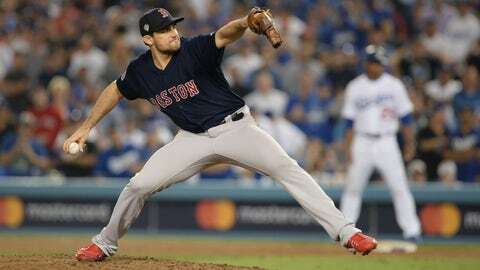 But he was a key tool for the Red Sox in their World Series run, hitting 100 mph on the radar gun while recording a 1.61 ERA and 0.806 ERA in 22 1/3 innings. He started twice in the postseason for Boston and relieved four times (sounds like he'd fit into Milwaukee's postseason pitching plan). There is a buyer beware, of course, as Eovaldi does have the injury history (he also had Tommy John surgery in high school), but there's big, big upside. The Brewers love players with positional flexibility and Gonzalez fits this new-wave type of player to the bill. Last year with Houston he played at least 24 games at first base, second base, shortstop and left field, as well as a smattering of games at third, right and center. Gonzalez had a huge season in 2017 (.303/.377/530, 23 HR), which seems something of an outlier when compared to the rest of his career, but he still popped 16 homers in 2018 and has a career .419 slugging percentage. He'd fit in well with Counsell's in-game strategies. Gonzalez showed he could be a frontline starter in the past -- while pitching for Washington he finished third in Cy Young voting 2012 and sixth in 2017. He didn't perform as well with the Nationals this past season, but he clicked for the Brewers, who acquired the left-hander at the trade deadline. 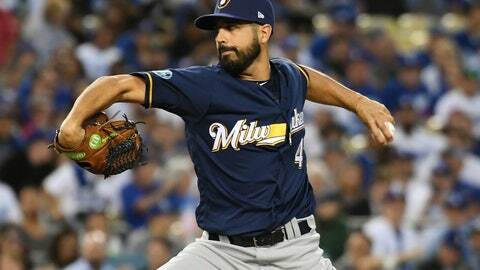 Gonzalez posted a 2.13 ERA and 0.947 WHIP in his five regular-season starts with Milwaukee and was tabbed to start two games in the NLCS (although both ended quickly, one due to injury). With Brent Suter out for 2018, Milwaukee could use a left-hander in the rotation. The question here is will the Brewers have an opening at second base? Jonathan Schoop is a non-tender candidate, Travis Shaw could likely move back to third base with Mike Moustakas a free agent and prospects Mauricio Dubon (coming off a torn ACL) and Keston Hiura might need more seasoning. There a number of older second baseman on the free-agent market. For our purposes, we'll go with Lowrie, who has some history with general manager David Stearns, as both were with Houston in 2015. 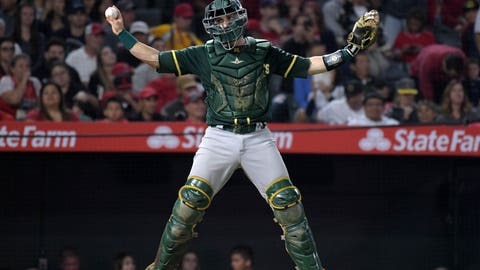 Lowrie is coming off two productive seasons in Oakland, batting .277/.360/.448 with 14 home runs in 2017 and .267/.353/.448 with 23 homers last season. He also could fill in at third base on occasion and maybe even shortstop. If Milwaukee isn't ready to hand the backup catcher role to Jacob Nottingham, perhaps a return of a fan favorite? Lucroy hit .284 with 79 home runs in nearly seven seasons with the Brewers. However, while his arm remains league average or slightly better, Lucroy hasn't hit well the past two seasons. 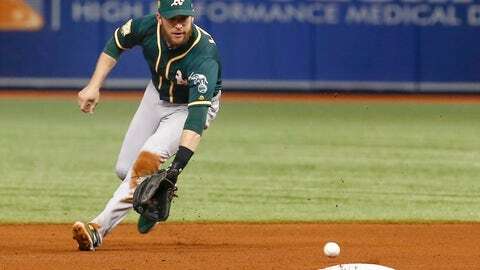 Outside of a brief stop in Colorado, where he hit .310 in 46 games, Lucroy had a lsash line of .242/.297/.338 in 77 games with Texas in 2017 and .241/.291/.325 for the A's last year. He has played on a playoff team in each of the last three seasons. Miley had a disastrous year in Baltimore in 2017 but really hadn't had a decent season since 2013 in Arizona (3.55 ERA, 1.317 WHIP). After signing as a minor-league free agent with the Brewers and having his season delayed due to injuries, he was magnificent for Milwaukee. In 16 starts, Miley had a 2.57 ERA and 1.215 WHIP. He also excelled in the postseason, allowing only two runs over 14 2/3 innings. Like Gio Gonzalez, he's a much-needed left-hander. One point of concern: Miley's strikeout rate was way down in 2018 to a career-low 5.6 K/9. Imagine having two Josh Haders available. From 2014-17, Miller was one of the most -- if not the most -- devastating relievers in the game. In 297 games over that span he had a 1.82 ERA, allowed 5.1 hits per nine innings with 14.5 K/9. But the left-hander struggled in 2018 due to injuries and pitched in just 34 innings, with a 4.24 ERA and 1.382 WHIP. His 11.9 K/9, while good, was his lowest rate since 2012. 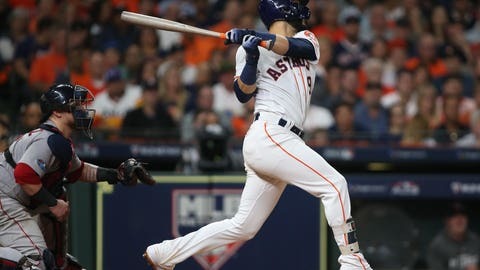 His season didn't end well, appearing in two playoff games for Cleveland but getting just one out while allowing a hit and three walks (one intentional) and throwing a wild pitch. 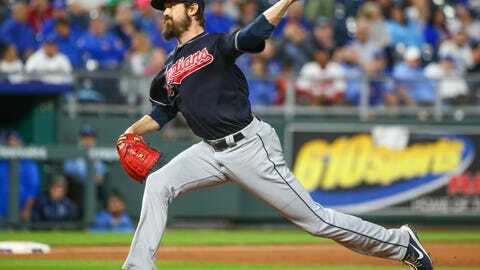 Miller is reportedly healthy, but teams might be skeptical and perhaps he'll need to sign a prove-it deal to help get a better contract in 2020. 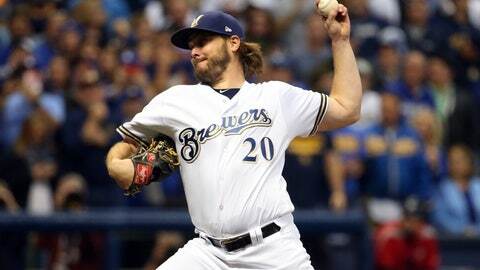 Again, the Brewers might need more arms in the bullpen and why not add one of the better power pitchers in baseball? 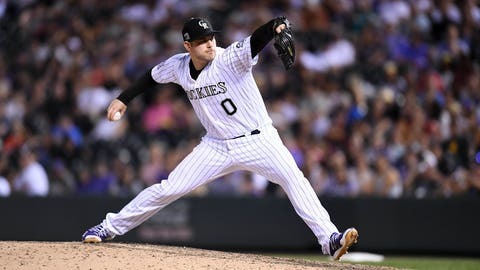 Pitching in Coloado, Ottavino still posted stellar numbers in 2018 -- 2.43 ERA, 0.991 WHIP, 4.8 H/9 and 13.0 K/9. He's been a bit wild the past couple of years (4.2 BB/9 in 2018), but from 2014-16 he walked only 2.2 per nine innings. 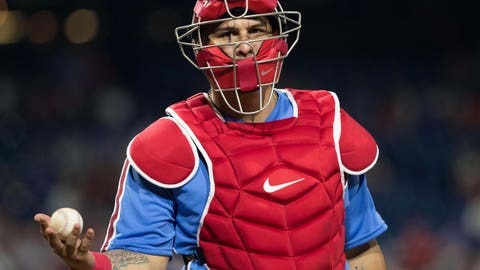 We know Manny Pina is a good defensive catcher, but he'll be 32 in June and his offense has been less than average over his career (OPS+ of 87 in 2018). Ramos is adequate defensively, but he certainly can hit. He posts a career slash line of .273/.317/.439 and is coming off a season in which he batted .306/.358/.487 with Tampa Bay and Philadelphia (130 OPS+). Ramos has reached double-digit home runs in each of the last six seasons with a high of 22 in 2016 with Washington. His bat would make the Brewers' lineup even more potent.